Grenade .50 Calibre is the next generation pre-workout from multi award winning sport nutrition experts Grenade. The formula combines research-validated ingredients including creatine mono, beta alanine, citrulline marlate and bitter orange peel powder. Turn every workout into explosive, and energy fuelled. 50 Calibre also contains patent pending MDS (Muscle Defence System). Take it to the next level with Grenade .50 Calibre. Creatine Monohydrate, Beta Alanine, Citrulline Malate, Acid (Citric Acid), Theobroma Cacao Seed, anti –caking agents (calcium silicate, silicon dioxide, tri calcium phosphate), Flavouring, Resistant Dextrin, Glycerol, Colour, (caramel powder), Arginine, BCAA Blend (L-Leucine, L-Valine, L-Isoleucine), Potassium Bicarbonate, Caffeine, Taurine, Beetroot Extract, Sweetener (sodium cyclamate, acesulfame, sucralose, sodium saccharin), Sodium Bicarbonate, Green Tea Extract, Glucuronolactone, American Ginseng, L-Tyrosine, Bitter Orange Powder, Niacin (Nicotinic Acid), Folic Acid. Suitable for vegetarians. Not for use by individuals under the age of 18. Consult a physician or healthcare professional before using this product if you have any allergies, medical conditions or are taking any medication. Contains high levels of caffeine (275mg persingle serving). DO NOT consumethis product if you suffer from high blood pressure. DO NOT consume within 4-6 hours of intended sleep. DO NOT use this product in conjunction with any other product containing caffeine or other stimulants. DO NOT exceed recommended dosages. Always read the label. 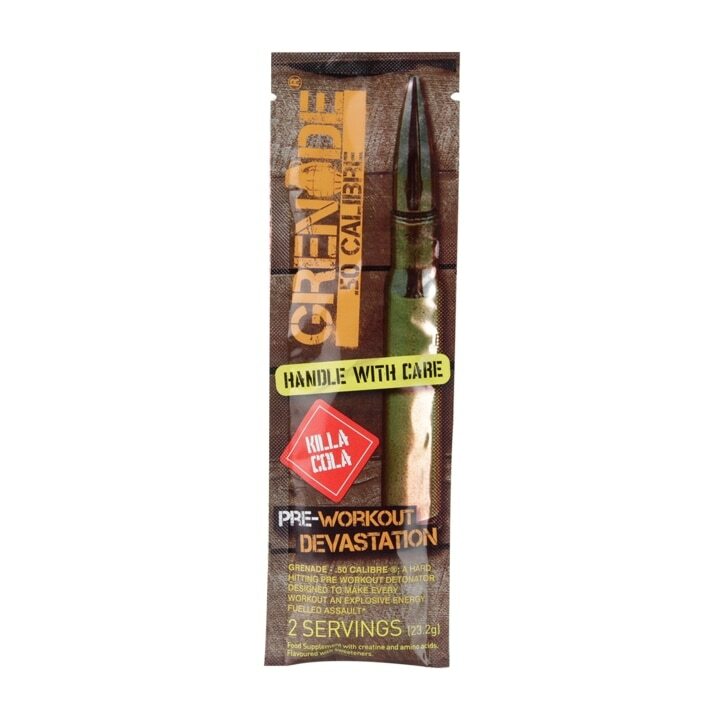 Grenade .50 Calibre Pre-Workout Killa Cola is rated 3.3 out of 5 by 3.